Posted May 24, 2005 by Pam Nelson & filed under Uncategorized. I love “y’all.” We don’t have a different form for plural “you” (like “we” or “they”) in standard English, but “y’all” fills that role in Southern English. (“Youse” is a Northern equivalent, I suppose.) I have often dreamed of having a platform to promote the elevation of “y’all” into standard written and spoken English. Maybe this blog is the place to start. But we need to stamp out its misuse. First, it is to be used only as a plural. Second, it must be spelled correctly. “Y’all,” as most Southerners know, is a contraction for “you all.” That’s why the apostrophe is after the y. So the mistake that appears on the newspaper ad below is baffling. 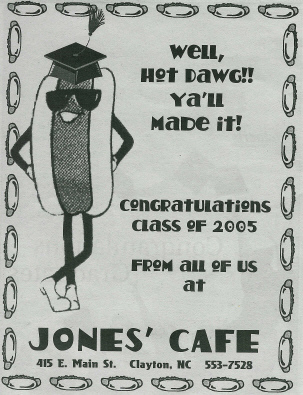 This ad for a very Southern restaurant in Clayton appeared in the hometown newspaper. You’d think these folks would get “y’all” right.